The Jaguar cichlid fish is known as Parachromis managuensis formerly and is native to Central America. These cichlids are beauty and it’s no wonder why their called jaguar’s because their coloration and pattern literally look like the big cats known as jaguars. 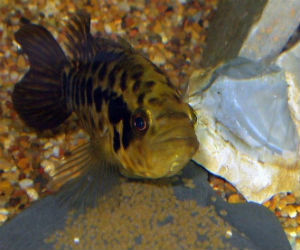 Other nicknames for this cichlid fish include Jaguar Guapote. 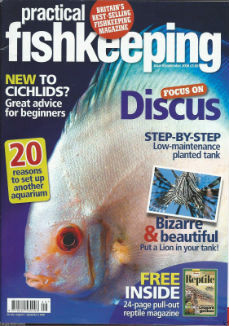 Jaguar cichlid fish are very common in the hobby and are what is called staple cichlids offered for sale in pet stores. Like other substratum spawning cichlids P. managuensis fish lay there egg on a hard surface and the male fertilizes the eggs. They breed no different than let’s say convict cichlids or jack Dempsey fish; they just require larger tanks and the approximate roommates. These cichlids are relatively easy to spawn and they can produce thousands of fry and the parents are highly protective of them. They will protect their spawn and confront the glass when approached. To be fair to this species considering buying a large tank and be prepared to do frequent water changes. Pairs form lasting bonds and are great parents.